Click here to download or view rules below. The AEPA Arabian and Half-Arabian Futurities, for 4 year olds, are held each year at the U.S. National Arabian Horse Show. Class Prize money, and the prize money per class placing, is determined by the AEPA. AHA will award a National Champion, Reserve National Champion, and a Top Ten in the Futurity Rail Class. 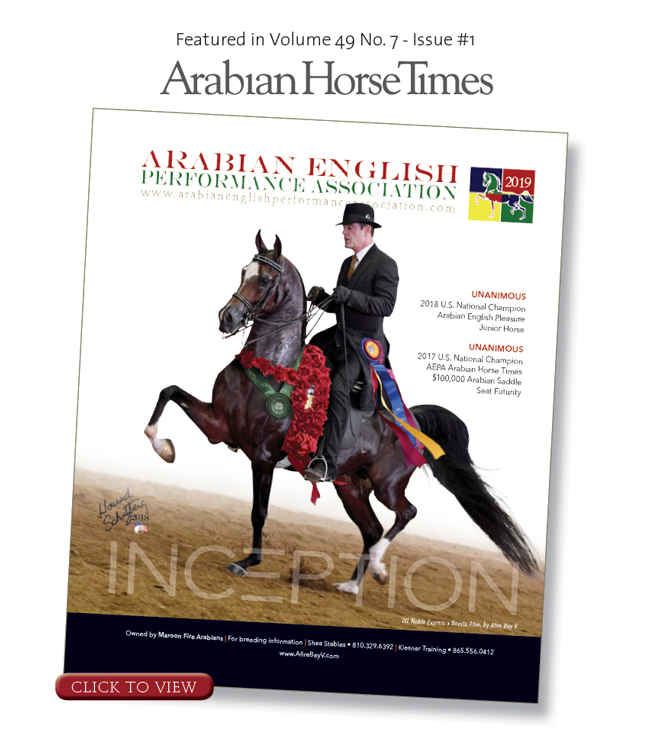 To be eligible to show in the AEPA Arabian Horse Times Arabian Futurity and the AEPA Equine Athlete Half-Arabian Futurity the 4 year old MUST have been sired by a stallion that was enrolled as an AEPA Stallion for the year that corresponds with the 4 year olds breeding year, i.e. To compete in 2019 the sire must have been in enrolled in 2014 (bred in 2014, born in 2015, 4 years old in 2019), etc. Reference the Stallion Auction Rules, on the AEPA web site, for additional information on eligibility. AEPA Futurities – CLASS ENTRY – To participate in the Performance Futurities the eligible 4 year olds owner or agent MUST pay the separate AEPA class fee in addition to all U.S. Nationals fees. Please reference the ‘AEPA Nomination/Entry’ form for deadline dates for entry into the AEPA Futurities and for AEPA class entry fees. NO horse will be allowed to show in the AEPA Class unless all fees are paid. Note: The 4 year old MUST also be entered into the U.S. Nationals Horse show. All class entries received by the AEPA are reviewed to insure that the horse entered is eligible to show in the AEPA Class. Any horse not eligible to show in the AEPA Class will be scratched from the AEPA class and the horse owner will be notified that the entered horse is not eligible to show. For horses not eligible to show in the AEPA class the AEPA entry fee will be refunded. Any entry fees paid to AHA, for an AEPA ineligible horse, are the responsibility of the horse owner or agent and the owner must contact AHA for any consideration of an AHA refund. For all AEPA Classes – AHA Registered OWNER – US Residents – A IRS W-9 form Must be provided to the AEPA prior to any class payout. Non-US Residents – A IRS W-8BEN form Must be provided to the AEPA prior to any class payout. The Registered Owner is responsible to provide this information, the AEPA will not be contacting owners to obtain this information. All AEPA Class payouts are only made to the AHA Registered Owner at the time the horse is shown, this also applies to any AEPA class not mentioned here.